Bitcore Blockchain with 3D animation live. Livenet displays any block and any transaction (TXID) in different sizes. The idea is to visually show the Bitcore blockchain for educational purpose. Let’s have a look at a few important items in detail. Blockchain is a digital ledger that provides a safe way of making and recording transactions, agreements and contracts – anything that needs to be recorded and verified at the same time as it is taking place. Blockchain database consists of blocks and transactions. Blocks contain batches of transactions that are “hashed” and encoded. Each block contains the hash of the previous one such as a link which results in a chain of blocks. When a transaction occurs, its details are encrypted and an unique multiple-character transaction number is then generated. In this way, all the users of the network are able to track their transactions1. Once the transaction is carried out, it is regrouped together in a cryptographically protected block with other transactions that had occurred in the last 2.5 minutes. The resulting block is sent out to the entire network for validation. Once the block of transaction is declared by the network as valid, it is then timestamped and added to a chain in a linear and chronological order. The new block of validated transactions is linked to the last validated block of the chain and so on. This results in a chain of blocks that shows every transaction that it has been made from the beginning of that blockchain2. Let’s go back to Livenet. 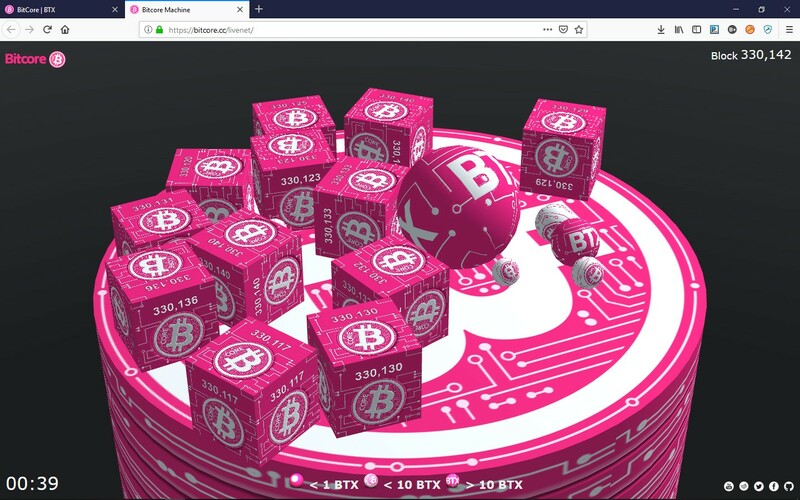 In the main screen where the representative Bitcore blockchain is located, you can see tiered blocks and balls above the blocks. There are different ball sizes to visualize different sizes of TXID. At the right top corner of the screen, you can see the block number which is 330,130. At the right bottom corner, you can find a timer starting at the moment you have launched the livenet. 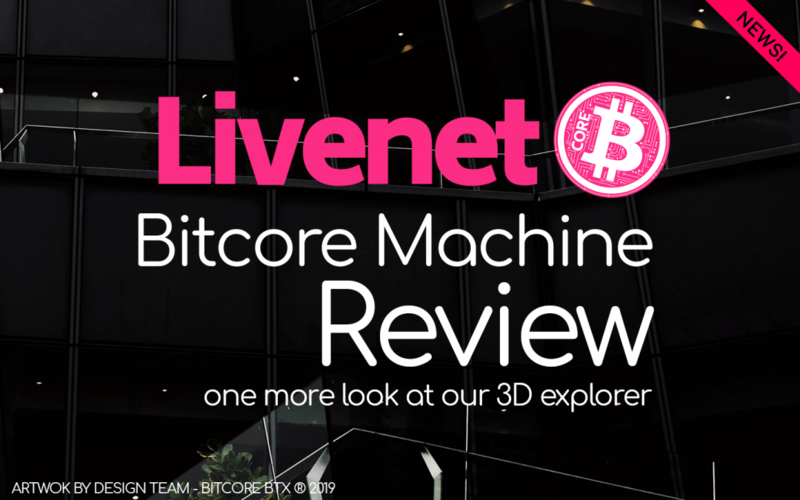 Finally, Bitcore machine is a graphical observatory of the Bitcore Blockchain and displays our Livenet both in blocks and in balls. According to your convenience, it is possible to use Livenet as a Screensaver or Background in your device to follow the Bitcore Blockchain development at any time. Reminder: Bitcore created approximately 5.000.000 transactions in only a couple of days and those have been saved forever on the Bitcore blockchain. Bitcore’s blocks currently have a size of 10 MB to 20 MB. Larger blocks can contain more transactions. The transaction throughput has always been a critical issue regard to cryptocurrency’s ability to compete with fiat payment solutions3.